The brain wants what it shouldn’t have: Choices. People say they want more choices but, then can’t decide. There is a famous jam study that is often used to bolster this point. Sheena Iyengar, a professor at Columbia University and the author of “The Art of Choosing,” conducted the study in 1995. In a gourmet market, Professor Iyengar and her research assistants set up a booth of samples of Wilkin & Sons jams. Every few hours, they switched from offering a selection of 24 jams to a group of six jams. On average, customers tasted two jams, regardless of the size of the assortment, and each one received a coupon good for $1 off one Wilkin & Sons jam. Here’s the interesting part. 60% of customers were drawn to the large assortment, while only 40% stopped by the small one. 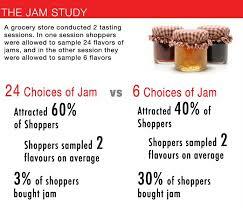 But 30% of the people who had sampled from the small assortment decided to buy jam, while only 3% of those confronted with the two dozen jams purchased a jar. It is much easier to make money by catering to consumers’ biases than by trying to correct them. George Akerlof and Robert Shiller, wrote about the economics of deception and manipulation. They explain that if people have a weakness from which a business can earn unusual profits, a business will do so. They provide the memorable and visceral example of people being irresistibly attracted to the scent of cinnamon and the success of Cinnabon. Businesses in unregulated free markets will profit from catering to satisfy people’s weaknesses. Companies may not have enough incentive to improve people’s decision-making skills because businesses can profit more from exploiting people’s cognitive biases instead of empowering people to choose wisely. Companies cannot capture all of the benefits from teaching people to choose wisely because some of those benefits are uncertain, delayed, and spillover into many other wide-ranging domains. Notice that the companion chimes in with a warning that the fancy resort might charge more. This is a slight contamination of the story, but perhaps not critical. In both versions the ultimate consumption act is the same – drinking one beer on the beach. 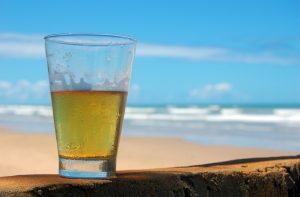 The beer is the same in each case. There is no possibility or strategic behavior in stating the reservation price. No “atmosphere” is consumed by the respondent. Many people find managing their household finances emotionally stressful, painful, and unpleasant. The empirical finding that people experience household management as having negative affect is important because people are likely to engage in little or suboptimal financial and retirement planning behavior due to procrastination. Then they rush to minimize their anticipated, experienced, and remembered unpleasantness. The continued extinction of traditional pension plans has made this more important yet people are unwilling because of the way it makes them feel. Tell people what they want to hear. It is how elections are won. Empowering people to make better decisions by improving their decision-making processes seems noble but, shouldn’t market forces dictate that? If you have bought or refinanced your house recently you have undoubtedly received correspondence “Urgent: About Your Mortgage” which gets people to open the mailing. The company pulls at your heartstrings to protect your family with the ability to pay off your mortgage if you die prematurely. The reality is you may be buying decreasing term insurance which could cost 30% more than level term insurance(doesn’t decrease). The insurance agents that do the best don’t overcomplicate it. They play up the mortgage protection aspect and keep the choice simple for the client. The agent who goes in with the intent of explaining the difference and trying to educate the client runs the risk of losing the sale by overcomplicating the process. Is knowledge power or is ignorance bliss? My professional life would feel less stressful if I took the latter. Don’t fight it and just give the people what they want. Let them eat cake. Knowing what I do about behavioral economics helps for a couple of reasons. First, I know most people don’t think like me(economist with no heart). Second, appealing to someone’s heart is going to help me reach a desired outcome most importantly for the client but, also for me.